Ya, look at that nasty hand, but look a beautiful ring! 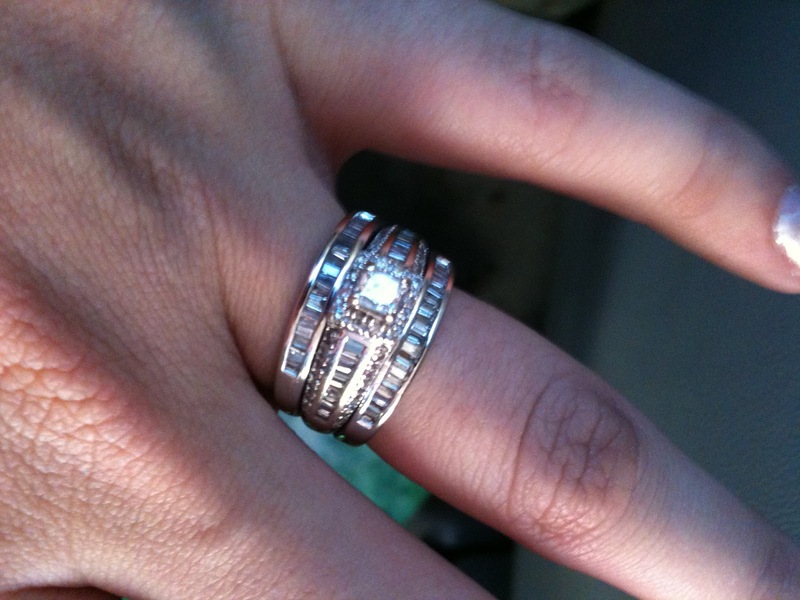 The middle part is my engagement ring, one of the bands is my wedding band and the other was bought for me just because. When SJ and I were dating we talked about getting married, ALL the time. He asked about rings, asked if I wanted to go look at them or if I wanted someone to just pick it out for me. I said I'd rather the guy go and pick out the ring for me. That I wanted him to find the ring that looked like me. He said he looked for days at different stores and finally found this one. I haven't seen any like it. The jeweler of course said there weren't many if any like it. (Who knows.) I love my ring. I love that SJ picked it out because it reminded him of my smile. I wouldn't trade my ring for another. I'm a little late linking up over here. but I really wanted to show off my ring! Your hand is SO not nasty!!! LOL Thank you so much for linking up your "bling"
So adorable :)! Love this post, love your blog!